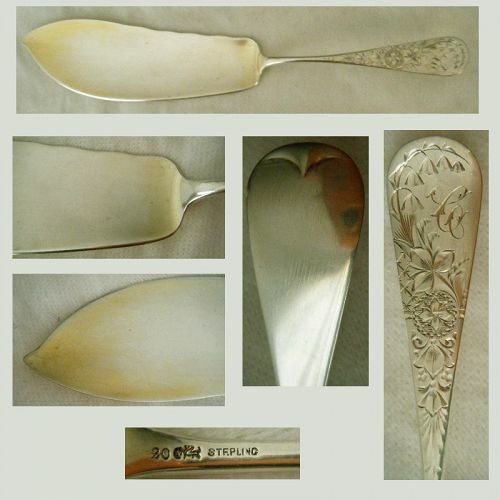 Issued in 1900, Alvin's "Majestic" was a multi-motif line of Art Nouveau flatware that featured a variety of floral themes. This example is a 5 5/8" long, substantial weight at approximately 1.3 T. oz., cream or sauce ladle. The flower is narcissus or daffodil and is represented by a number of blossoms on the handle front and leaves and buds on the backside. "Jenny Lind" was a pattern first introduced by New York City's Albert Coles in 1850, although numerous contemporaneous manufacturers took up the design, leaving extant pieces that bear a variety of makers' marks. One of Kirk's earliest patterns, "Wadefield," essentially a "Pointed Antique" design, was introduced in 1850 and continued in production for nearly a century and one half. Issued at the turn of the 20th century, Gorham's "Henry II" pattern was an homage in design to the English court at a dramatic time in its history. The central feature is a lion's face set midway on the handle. This is surrounded by an array of acanthus leaf (one of which forms the tongue of the lion), fruit, scrolls, and scaling as would be found on a suit of armor. Designed to hang from a teapot, this 2" diameter, 1 1/4" high, .7 T. oz. all silver, basket style tea (leaf) strainer has a wire prong that fits in the pot spout, and which is also attached to a pivoting wire bail. It is marked "Sterling" on the wire, and "Sterling," model number "24," and "lion, anchor, G" for Gorham on the basket. Dating circa 1865, this 7 1/2" long, weighty at 1.5 T. oz., master butter knife is stamped "*F. & H.*" on the blade for Boston's Farrington & Hunnewell, and "Pure Coin," which is a New England term, on the underside of the handle. It is twisted, with the handle and blade set at right angles to one another. Solid silver, this piece measures 5 3/8" long and weighs .9 T. oz. 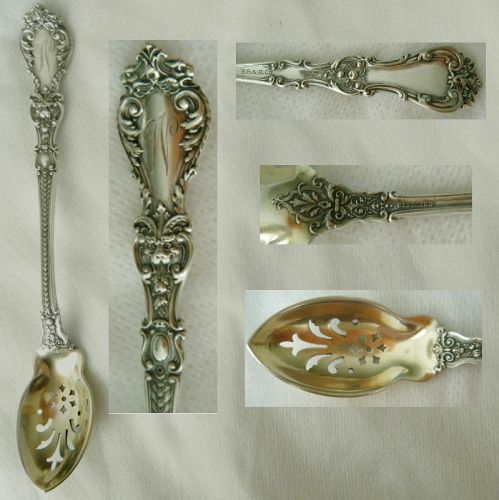 A bon bon aka confection spoon, it has a round, 2 3/8" diameter, slightly cupped, scalloped edge, serving end. The pattern is Whiting's "Lily of the Valley," issued in 1885. This has a pointed end handle, while some pieces in the line have squared off ends. Having a slender handle with pointed end, faint midrib on the reverse, and elongated drop on the backside of the bowl, this teaspoon measures 5 5/8" long and weighs approximately .4 T. oz. (12 grams). It is marked GH in an oval, attributed to George Hendel (1776-1842), born in Philadelphia and working in Carlisle, Pennsylvania. 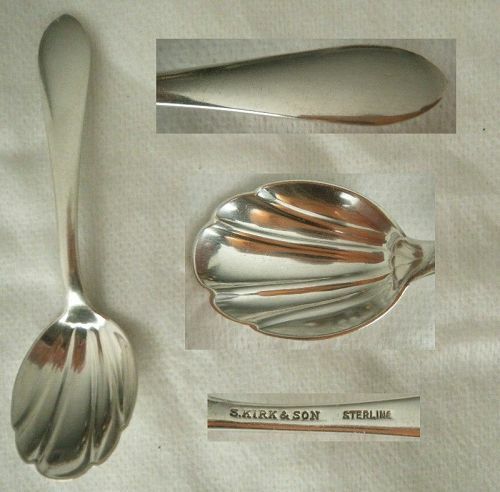 Gorham "Luxembourg" Sterling Silver Pea Spoon, "Whist Club 1897"
An impressive serving piece that measures 8 3/8" long and weighs nearly 2.7 T. oz., this item has a double provenance that traces to the late 19th century. First, the pattern is "Luxembourg" made by Gorham and introduced in 1893. This particular example is a pea spoon with a large, round, 3" diameter, reticulated, shallow bowl with a gold finish on both sides. Utilizing an "Old English," i.e. rounded end with a reverse tipt back, form, "Lily Engraved" is one of numerous bright cut designs Whiting and other manufacturers produced in the 1880s. Attractive and artful, these patterns showcased the skills of engravers of the period and were apparently well received in their time, given the variety of examples still available today. This piece is a lengthy, 10 1/2", 3.1 T. oz., all silver fish slice. This weighty, 5.3 T. oz., oval bowl impresses with its 3 7/8" high, upswept pair of arms attached to a 4 3/4" by 3 3/4" oval body that sits on a 2 3/4" by 2 1/4" footed base. It was made by "Tiffany & Co.," so marked on the underside, along with "Sterling Silver," "925/1000," "C" (for director Charles T. Cook, 1902-07), and model number "15298" introduced in 1902, and order number "5156." It is subtly Art Nouveau in style, with an undulating double upper rim, and curvilinear arms. Most American tongs of this size, 8 1/8" long and 2.7 T. oz. in this instance, and configuration, namely with a talon or fork grip combined with a spoon or cup grip, date from the mid 19th century. Commonly identified as chicken (salad or fried) tongs, they might have have been used for various salads. This coin silver pair are particularly attractive, combining several design features. This place, aka dessert or oval soup, spoon measures 7" long and weighs approximately 1.0 T. oz. It is appealing in several respects. First is its pleasing form, with a broad, down turned, "Reverse Tipt" handle, oval bowl with a pointed end, and clean drop on the bowl back. The name "H E Benedict" is engraved in handsome, feathered script, lettering set sideways on the handle. Identified in Crescent City Silver published by the "Historic New Orleans Collection," as either replacing or succeeding P. Zimmermann, Charles H. Zimmermann operated immediately following the Civil War, from 1866-70. Multi-motif, the portraiture on this 8 9/16" long, heavy at 4.1 T. oz., cold meat fork is lily. The blossoms and leaves fold over and upon one another, rising from of the surface of the silver as if sculped out of the material. This ice cream knife or slice is about as large an example of such things as can be found. It measures a full 12" long and weighs just over 5.0 T. oz. It is solid sterling silver, with a 7 1/2" by 1 3/4" flat blade that has a beveled lower edge and upswept, pointed, tip. The upper edge is perfectly straight. The pattern is "Corona" by Dominick & Haff. It incorporates a shell design that appears on both sides of the handle terminus and at the join with the blade. An early example of Whiting's Art Nouveau "Lily" pattern, this piece is marked with the company lion emblem, "Sterling," and "Pat. App. For." A cream or sauce ladle, it measures 5 3/4" long and is relatively heavy at 1.5 T. oz. The handle is engraved with a feathered script "P" monogram, while the bowl is finished front and backsides with a pale, satin, gold wash.